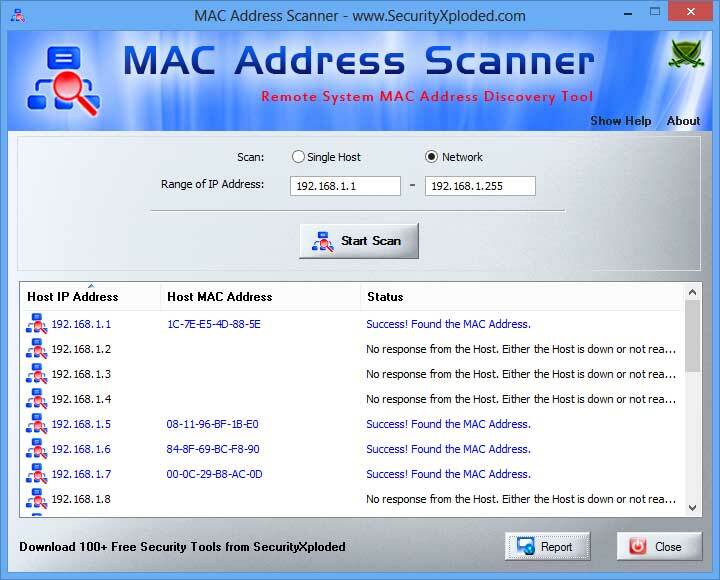 MAC Address Scanner is the free desktop tool to remotely scan and find MAC Address of all systems on your local network. It allows you to scan either a single host or range of hosts at a time. During the scan, it displays the current status for each host. After the completion, you can generate detailed scan report in HTML/XML/TEXT/CSV format. Note that you can find MAC address for all systems within your subnet only. For all others, you will see the MAC address of the gateway or router. On certain secure WiFi configurations with MAC filtering enabled, this tool can help pentesters to find out active MAC addresses and then use them to connect to such wireless network. Being GUI based tool makes it very easy to use for all level of users including beginners. It is fully portable and works on all platforms. New feature to generate MAC address scanner report in CSV (Comma-Seperated Values) File Format. 4,346 5,527 SecurityXploded Jan 27, 2014 - 22:51 1.5 2.55MB ZIP , out of 24 Votes.